Since its release last year, the ASUS B250 Mining Expert made ambitious cryptocurrency hobbyist farms more accessible and industrial-scale operations more efficient. It was hugely successful, with a sales volume that far exceeded expectations. With the concept proven in practice and more insight gained on what miners need, we redefined the formula for a second generation. ASUS is excited to announce the new H370 Mining Master motherboard that increases density with support for up to 20 graphics cards, simplifies connectivity by letting USB riser cables plug directly into the PCB, and reduces downtime by making problems easier to diagnose. You can see it running at full capacity in a custom mining rig being unveiled at Computex 2018 in Taipei, Taiwan. ASUS is featuring this blockchain behemoth at the ASUS booth, #M410 in Nangang Hall, from June 5-9. For an early preview of the H370 Mining Master, please visit us at ASUS EdgeUp. Mining is a numbers game; it’s only worthwhile if the value of the cryptocurrency you generate exceeds the cost of producing it. Increasing the number of graphics cards per node is a great way to stack the deck in your favor. Typical mining setups feature a common PCIe riser design with each graphics card being connected via a PCIe x1 link routed over a USB 3.1 Gen 1 interface with a SATA power cable. The risers responsible are typically made up of three pieces: the x16 slot that hosts the graphics card, the x1 card that plugs into the motherboard, and the USB cable that connects them. The H370 Mining Master greatly simplifies this chain by replacing its predecessor’s x1 slots with banks of vertical PCIe-over-USB ports that let riser cables plug directly into the motherboard. This direct connection is sturdier than using a PCIe card, with less chance of inadvertent disconnects, and it reduces the total number of parts in your mining rig. Efficient mining requires a few UEFI tweaks that are consolidated in a special Mining Mode. The motherboard’s PCIe lanes are set to run at Gen 1 speeds to improve compatibility and stability with USB riser cards. Other tweaks specific to GPU based crypto crunching are activated by default, so you’re ready to go right out of the box, without having to mess around in the firmware interface. ASUS H370 Mining Master Motherboard will be available in North America starting in Q3 2018. 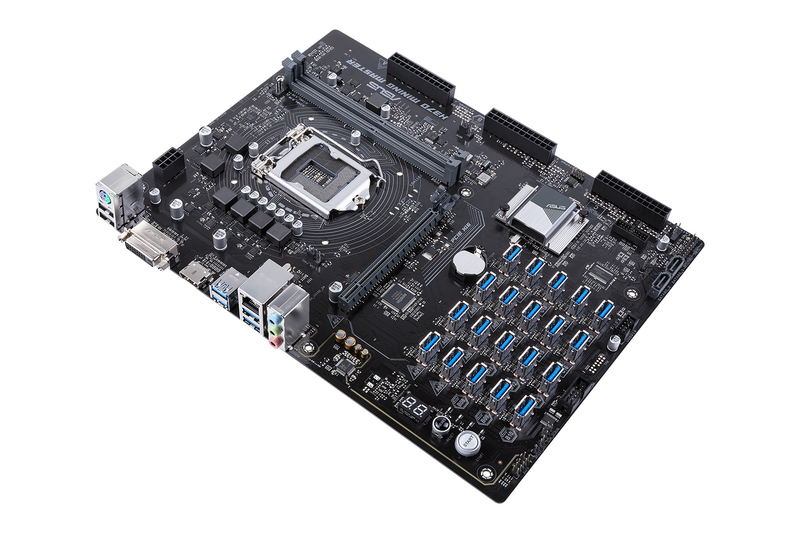 For additional information, product images and specifics on the H370 Mining Master motherboard, please check out our launch article at ASUS EdgeUp. Please visit ASUS or contact your local ASUS representative for further information or if you’re at Computex 2018 in Taipei, be sure to check out the board in our amazing demo rig at the ASUS booth, #M410 in Nangang Hall, from June 5-9.